With a large sign-up bonus and other valuable rewards — including a free hotel night each year — the IHG Rewards Club Premier card is packed with value. The new IHG Rewards Club Premier card from Chase comes with one very compelling reason to apply: An 80,000-point sign-up bonus. It also features a hefty $89 annual fee. However, frequent guests of IHG hotels should find that the card’s rewards along with its multitude of hotel perks are well worth the price of admission. The IHG Rewards Club Premier card is currently offering 80,000 bonus points to new cardholders who spend $2,000 within three months of account opening. Plus, cardholders who spend $5,000 in the first six months can grab an additional 40,000 points – for up to 120,000 points total. Like most hotel credit cards, IHG points are inflated – worth about two-thirds of the average credit card point. Even so, this is a generous offer, worth up to 12 hotel nights – or up to 15 nights if you use IHG’s free fourth night benefit to stretch your bonus points. For frequent guests of IHG-brand properties, such as Holiday Inn or Crowne Plaza, the Rewards Club Premier card is extremely rewarding, offering 10 points for every dollar spent on IHG hotel stays. And, unlike most hotel cards, IHG lets you rack up bonus points on other types of purchases, including gas station, grocery store and restaurant purchases. If you are looking to maximize your rewards earnings on your credit card spend, this is not the highest rewards rate you can earn on these types of purchases (nor the best option for earning IHG points at restaurants – check out the Chase Sapphire Preferred Card for a better alternative). However, if you are an IHG loyalist who wants to stick to one credit card for most of your spending, this is a good reason to make the IHG card your go-to card. The IHG card also offers a great incentive to hold on to the card in the long run – you receive a certificate for a free hotel night each year on your card anniversary. If you make sure to redeem your certificate before it expires at the end of the year, the free night’s stay should more than justify the card’s $89 fee. In addition, card members earn 10,000 bonus points each year they spend $20,000 on the card. This is a steep spending requirement, especially for cardholders who intend to rotate this card with other cards, but if you prefer to put all your spending on a single card, it’s yet another to keep the IHG card at the top of your wallet. The Rewards Club Premier card also happens to feature an exclusive perk for cardholders: A free fourth night on every rewards stay. This is a great way to stretch your rewards points, and it’s one feature that gives IHG an edge over its competitors. While other hotel rewards programs, including Marriott and Hilton, offer a free fifth night on rewards stays, IHG improves on them by allowing you to trigger the free night benefit with only four nights in a row. 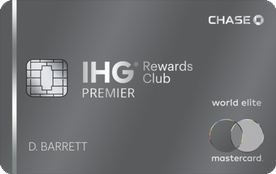 The Rewards Club Premier card grants you automatic platinum elite status with IHG. Unlike many competitors, elite status in the IHG Rewards Club actually entitles you to valuable hotel perks, including complimentary room upgrades, guaranteed room availability, a $30 spa credit for each hotel stay and a 50 percent bonus on your base points earnings. On top of the card’s sign-up bonus and annual free night certificate, elite status is the next best reason to sign up for the card. The IHG card comes with a long list of travel benefits that make it a good companion on your travels around the world. It doesn’t charge a foreign transaction fee – meaning, you can use it in foreign countries without having to pay a 2 to 3 percent fee for the privilege – and it offers a $100 credit for Global Entry or TSA Precheck. If you use the card to finance your plane ticket, you can also count on some decent travel protections, including trip cancellation insurance and insurance for lost and delayed baggage. Unfortunately, IHG makes it a little harder to redeem your points for rewards stays, compared to competitors such as Hilton who guarantee that you can find a rewards room anywhere a standard room is available. Though IHG doesn’t enforce blackout dates on rewards stays, it does state in the fine print that properties may offer limited inventory for rewards nights. In other words, you may have difficulty finding rewards nights at certain properties, especially in popular locations or during peak travel times. Another drawback: IHG adjusts the points required for its rooms on a yearly basis – usually for the worse — which means, you need to redeem your points quickly to ensure that they don’t get devalued in the next update. On the plus side, IHG offers a worldwide network of more than 5,200 hotels. While the IHG footprint is not as extensive as, say, Hilton or Marriott hotels, you should be able to find options in most places you want to travel. Furthermore, since the IHG portfolio includes more affordable brands such as Holiday Inn and Holiday Inn Express, cardholders on a more moderate budget should be able to find plenty of options with the program. Why get the IHG Rewards Club Premier card? You’re a frequent guest of IHG hotels. You want to collect a large sign-up bonus. You’re looking for a generous hotel rewards card with a large hotel network. You want elite status in a hotel loyalty program that comes valuable perks. Spend $2,000 in the first three months to earn the 80,000-point sign-up bonus and $5,000 in the first six months to earn an additional 40,000 points. Book your rewards stays in four-night increments to get the fourth night free. You can use your card while traveling abroad, since it doesn’t charge a foreign transaction fee. Stick to redeeming your rewards for hotel stays – the value on other redemption options is poor. Redeem your annual free night certificate before it expires at the end of the year. Consider rotating in a Chase Sapphire card for general purchases – you can transfer Ultimate Rewards points into your IHG account for a better value. Redeem your points quickly to prevent them from getting devalued.